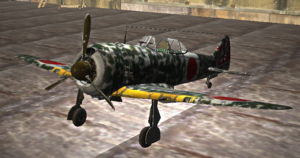 The Nakajima Ki-44 Shōki (鍾馗, Zhong Kui) was a single-engine fighter aircraft used by the Imperial Japanese Army Air Force in World War II. The type first flew in August 1940 and entered service in 1942. 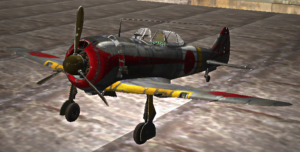 The Allied reporting name was “Tojo“; the Japanese Army designation was “Army Type 2 Single-Seat Fighter” (二式単座戦闘機). 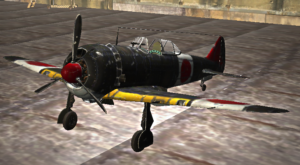 It was less maneuverable than its predecessor, the nimble Ki-43, and pilots disliked its poor visibility on the ground, its higher landing speed, and severe restrictions on maneuvering. Yet, it was obvious the Ki-44 was clearly superior overall as a combat aircraft compared to the Ki-43. As an interceptor it could match Allied types in climbs and dives, giving pilots more flexibility in combat and greater pilot confidence than the Ki-43. Moreover, the basic armament of four 12.7mm machine guns or two 12.7mm guns and two 20 mm cannons (plus a few aircraft which carried two Ho-301 40 mm cannons of limited range) was far superior to the older Ki-43’s two 12.7mm machine guns. These characteristics made the fighter, despite performance restrictions at altitude, a useful B-29 Superfortress interceptor and one of the Japanese High Command priorities during the last year of war. However, like most of the Japanese aircraft flown in the last part of the war, the low availability of properly trained pilots made them easy targets for experienced, aggressive, and well trained Allied pilots flying superior aircraft.